After my work announced it was having a costume contest the day before Halloween, I was left scrambling for ideas at the last minute. I do not like to buy my costumes pre-made or at the store because they seem to all look the same and just aren’t that creative. After a trip through the store looking for inspiration I came across a Care Bear movie and decided that it could be whipped up in a night. Powder pink is not an easy color to come by in adult clothes so I ended up buying some white leggings, a white shirt and a bottle of RIT pink petal dye. The tummy was some white felt that comes in a big iron on sheet. After dying the white clothes and drying them, all I had to do was cut the felt in the shape of a tummy and iron it on. 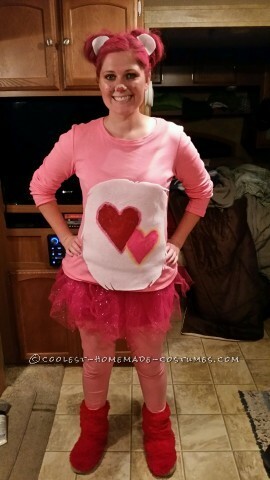 The hearts were painted with some acrylic craft paint and I pulled a pink tu-tu out of the Halloween box from costumes that I had saved from the past (because what girl doesn’t love an excuse to wear a tu-tu). The make-up was from my regular stash of eyeshadow that I already had. To do the ears I just put my hair into two buns, sprayed it with pink hair color, and cut out two pieces of the white felt to look like the middle of the ears which was held in place by a bobby pin. Everyone at work loved the costume and said it really fit my happy personality. The contest ended up being a tie and I won more money than it cost to make the entire outfit! Homemade costumes are the best!